At Metropolitan Industries, we’re proud to be your single source for reliable pumps, control systems, heating and ancillary equipment. By offering expertise in many water and wastewater industries, we’ve established ourselves as experts over the last 60 years, but we also know that there’s more to expertise and reliability than simply supplying pumps and equipment. With unique requirements from every customer and full systems that are customized to meet specific needs, guaranteeing quality is as much about testing every product that leaves our facility as it is about manufacturing it correctly. 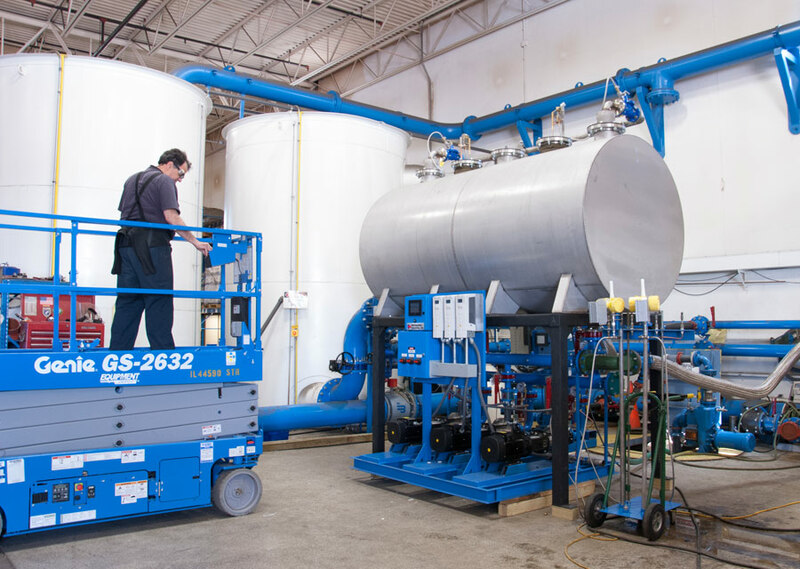 Full system testing greatly reduces startup time while decreasing the potential for additional expenses in the field by allowing the contractor to connect our pumps and systems without concern. However, as pumps, control systems, ancillary components and the systems in which these components must work continue to change, system testing must do the same. Fortunately, we take testing seriously. We like to think of ourselves as a one-stop-shop for our customers, offering everything under one roof, and testing is no exception. However, it’s not quite that simple. Just as we’ve never been comfortable resting on our laurels regarding the products and services we offer, we’re also always looking for ways to improve our testing capabilities and offer even greater peace of mind to our customers to ensure the proper functionality of everything that leaves our facility. As part of this effort, our testing capabilities were recently upgraded to keep pace with demand and technology and continue our commitment to offering quality product and services to the industries who’ve come to trust the Metropolitan name. Our state-of-the-art, on-site test lab is designed to perform a full range of testing on all of the equipment we supply. This includes hydrostatic-pressure, hydraulic-performance, and hydronic-equipment performance testing on both individual items and large packaged/custom assemblies. Packaged-system testing is especially important as system-integration should seamlessly meet all customer specifications. To ensure that all testing meets the standards of the Hydraulic Institute or other national standards that may be required to fulfill contract documentation requirements, all testing can be certified by a licensed Professional Engineer registered in the state of Illinois. As our customer requirements range from smaller commercial and residential applications to industrial, large commercial, and municipal pumps, controls, heating, and systems products, the quality control required increases. Our four water tanks offer a combined capacity of 20,000 gallons and we have a flow capacity that can hit 10,000 gpm. Paired with our 800-amp electrical service, pressure capabilities up to 700 psi, and variable frequency drives, the lab is setup to handle almost every scenario. Additionally, all of our instrumentation is regularly calibrated to ensure accuracy. A broad array of different types of pumps, controls, and systems can be tested by Metropolitan’s trained staff, including self-priming pumps, centrifugal pumps, submersible pumps, multi-stage pumps, pressure reducing valves, gas-fired thermal equipment, and control systems operating with mechanical components and instrumentation. By offering all of these services on-site where we build and assemble our products, we’re eliminating the need for an outside lab or contractor, which reduces completion time, ensures full familiarity with our products, and eliminates handling errors that could arise during equipment transport to and from an outside facility. Maintaining all of these testing capabilities remains important, but we’re also constantly working to improve these capabilities and offer more to our customers. Automated Testing Through A Programmable Logic Controller (PLC) – Rather than logging all data individually and manually, necessary data is now automatically recorded simultaneously. Actuated throttling valves – Manual valve adjustments are a thing of the past as testing is now automated. Flow meter monitoring – Based on testing requirements, we can now select from 4 different sized flow meters in the MetroCloud Test Lab application. Wireless Pressure Transducers – Portable stands can connect pressure sensors to MetroCloud SCADA without power or signal wires. MetroCloud Application – A real time view of testing on a MetroCloud client from any Internet connected device. Automated Data Population – All data is logged into an Excel spreadsheet and calculations such as efficiency and affinity laws are automatically computed. Coming Soon! – Witness testing of projects by customers from remote locations. We’re proud to further enhance our testing capabilities with all these improvements but, even with these enhancements, we’ve got our eye focused on the future. It’s difficult to say what the next set of improvements will bring; however, it’s safe to say our customers will be top of mind for every decision we make.